Q - How much do you cost? A - Fees for the Five Piece Band: For smaller parties and functions within 1hr from Glastonbury a typical fee would be £500 plus lighting and PA(Public address speaker system). For larger functions and weddings, our special event service starts from £700 plus lighting and PA, depending on venue and distance. We can also provide different lineups (smaller or larger) to suit your requirements. Q - How long do you play for? A - Typically we play for a total of 2 hrs 15 mins divided into either 2 or 3 sets, with a 15 - 20 mins break in between. These can be modified to suit your requirements. Q - Can you play music in between sets? A - Yes the PA system can play customers CD's between sets, we recommend a disco is booked, as the atmosphere can be kept going with a DJ playing music. Q - Do you require anything specific? A - We require at least one 1 full 240v, 13amp supply for our PA, lighting & back stage equipment, the stage area should be at least 3m x 4m. The band require somewhere to change and rest in + access to food & refreshments. Q - Will You Play Outdoor Events? A - Yes we love to, provided there is adequate, professional, weather proof cover for the band and equipment. Should you be in doubt, please ask. You can call Steve on 07786351780 or email. The band also has a set of solutions for outdoor events including a 4x4m bandstand marquee, or a 4x8m bandstand and dance area marquee. Q - Can we select what you play? A - Yes you can make a selection from our list of current songs. Q - Will you play a specific song i.e. our first dance etc? A - Depending on time and suitability the band can learn a song of your choice, if this is not possible a CD copy can be played through the pa system. Q - Do you require a deposit when we book you? A - A deposit of £100 is required to book the band; the balance is due on the night at the conclusion of the performance. Q - Can we see you perform before we book you? A - We do public performances and showcases; these will be listed in or gig diary, and we welcome all to attend. Q - Can you send a demo CD? A - Yes if required, however for an indication of our sound please click here to go to our demo page. Q - How do I book the band? A - Simply go to our Contact Us page & fill in the Enquiry form, or call Steve: 07786 351 780. Q - Can the band provide publicity posters? 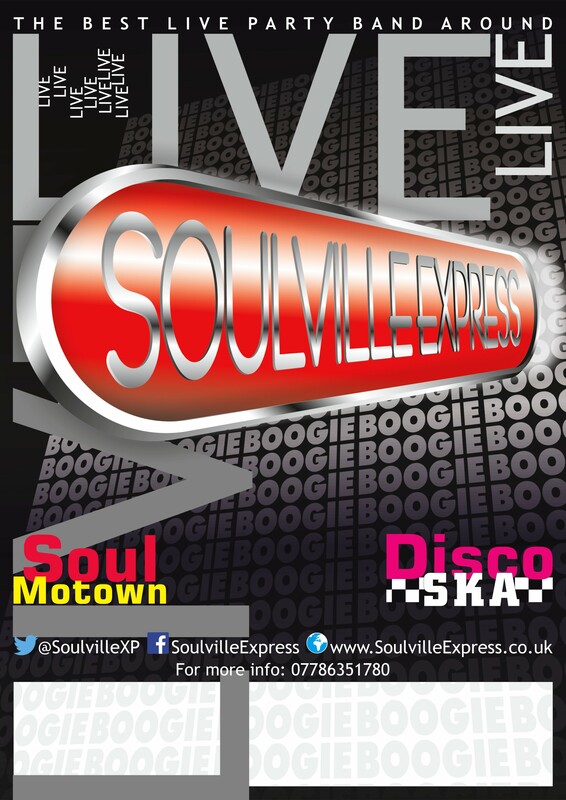 A - You can download our poster here-> Soulville Express A4 Poster PDF or call Steve: 07786 351 780. Soulville Express is a wedding band based in the South West. We are a function band providing top quality professional live entertainment in the South West. Soulville are a Party band from Glastonbury Somerset. We provide the following services: wedding band Somerset, wedding band Dorset, wedding band Devon, wedding band Bristol, wedding band Bath, wedding band Taunton, wedding band Exeter, wedding band Yeovil, wedding band Weston super mare, west country wedding band. party band Taunton, party band Exeter, party band Yeovil, party band Weston super mare. West country function band, west country party band, function band Somerset, function band Dorset, function band Devon, function band Bristol, function band bath, function band taunton, function band Exeter, function band Yeovil, function band Weston super mare, party band Dorset, party band Devon, party band Bristol, party band Bath.